Are you looking to customize the look of your stock Messaging app? 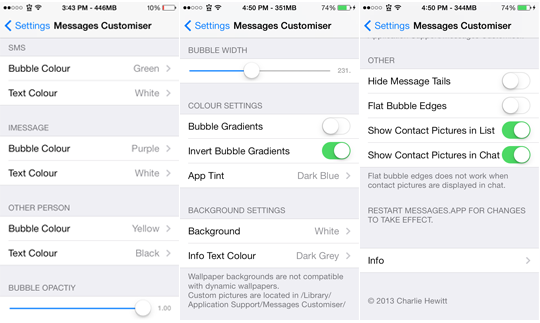 Messages Customiser is a free tweak from the ModMyi repository, developed by Charlie Hewit, giving you plenty of options to tweak the stock Messaging application on your iDevice. After installing Message Customiser, head over to the general Settings application where you will find the tweaks preference pane. The tweak provides the user to change the color of both the incoming, outgoing messages of SMS, iMessage chat bubbles and text colour. There are 14 different color combinations to choose from. Users can change the bubble opacity and bubble width. In addition, theres the access to choose from two different bubble gradients, as well as choosing a color to tint the applications interface. There are various options to change your background settings. Users can change the color of their background, select the wallpaper they are using, add three different overlay’s to that wallpaper, add a custom picture and change the info text colour. Custom images will have to be placed in the directory /Library/Application Support/Messages Customiser. After placing a custom image in that directory, users will be able to select the “Custom Picture or Custom Picture- Blurred” option in the tweaks preference pane. Other options include, disable or enable contact pictures in list, or in chat, hiding the message tails and flat bubble edges. Just like the stock Messaging app, if you do not have a contact photo for the person you are chatting with, the tweak will show the person’s first and last initial. You will find it necessary to kill the Messaging application in the app switcher and re-launch the stock Messaging application after you make changes in the Messages Customiser preference pane for the effect to take place. If you’re into theming your iDevice, you will have fun making the Messaging application personal to your liking and separate you from the stock Apple design. The tweak is for iOS 7 only and is compatible with all devices, including 64-bit. Let us know what you think of Messages Customiser in the comments. For custom photos, You can navigate to Library/Application Support/Messages Customiser. There you will find the custom images and what they are named. I would make a copy of those and then you could replace those images with your own. As far as your bubble being blank, maybe you have turned down opacity too much in the preference pane. Will this work if we are using bite SMS? Will the tweaks still work? You can enable or disable “Show contact pictures in List or Chat” under “Other” in the tweaks preference pane in general settings. If you do not have a contact picture for yourself or a friend, you can open up the stock contacts application, select a person, select edit (upper right hand corner), and add a photo to the person you selected. If your in the messaging app with a friend, you can select contact in the upper right hand corner, sleet the info button, select edit and add a photo that way as well. Iv heard it works fine back when bitesms was 8.0.5 beta and Messages Customiser was 1.0, but there may be some issues because bitesms is in beta. Im currently not using BiteSMS and waiting on Messages +, Anemo, or another quick reply tweak. For anyone having trouble having their own contact picture not showing up in the chat. First add yourself as a contact with a picture. Second go to settings>mail, contacts, calendars> my info choose yourself. restart messages and you should see your picture. BOOM! Can you do a step by step how to change the custom picture? I want to change it to a picture on my camera roll. What name do I change? and how do I find the name? When is this going to work on ios8.1? I need it.